Author Frank Schildiner, known for writing wild tales across several genres, takes a swing at the supernatural 1960s in his own Pro Se Single Shot Signature Series-JOHNNY RICH! The first tale in this new short story series, SATANIC SPIES AND OTHER MUSICALS, Johnny Rich, noble, occult expert and spy and his beautiful partner, scientist and martial artist only known as Ma, find their services requested by a major player in British intelligence. Their mission-find the daughter of an earl who has been entranced by a musician cult leader with a very murky background. So murky than May and Johnny Rich may drowned in it! 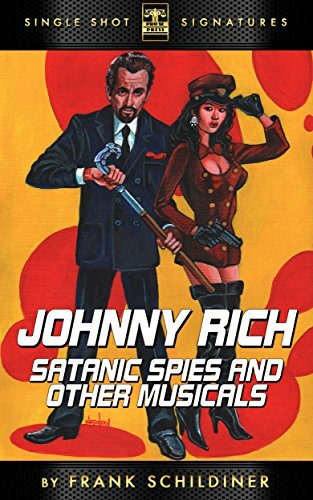 Featuring a groovy cover by Larry Nadolsky, logo design by Jeffrey Hayes, and formatting by Marzia Marina, JOHNNY RICH: SATANIC SPIES AND OTHER MUSICALS is available now for only 99 cents at Amazon at https://www.amazon.com/Johnny-Rich-Satanic-Spies-Musicals-ebook/dp/B01N9WA7PO/ref=sr_1_1?ie=UTF8&qid=1486046250&sr=8-1&keywords=JOHNNY+RICH+SCHILDINER and for most digital formats via Smashwords at https://www.smashwords.com/books/view/699686.